I've actually seen a person use a step ladder as a cucumber trellis and had the vines grow all the way over the top and down the other side. In garden supply catalogs you often see cucumber trellises advertised. They are all 4 feet X 4 feet or less. This is why I expected cucumber vines don't get all that long. That was it. I didn't have any trellises at the time I just used what I had. I did build a trellis this year for cukes after seeing what they could do last year. That was my first time with cukes. 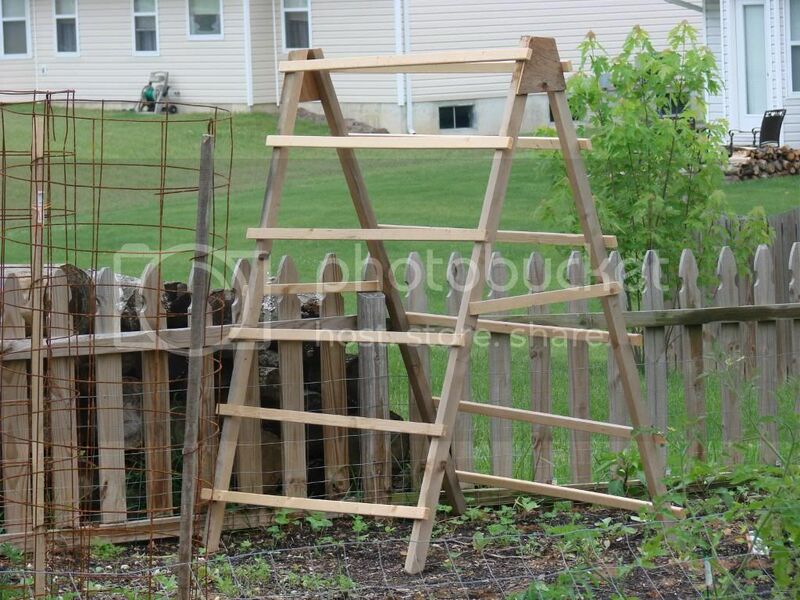 When I first put up the tom cage for the cukes I used a short leftover piece of a tomato stake for an end support. I had to replace it with a piece of copper pipe mid season cause the weight of the cukes snapped the stake. Since you asked here is my new (completely thrown together in about 30 min) trellis. This is the first time we've trellised cukes, but I have arched a cattle panel, 50" wide and 16' long, to grow the cukes over. I have 4 plants at each end of the panel and will train them up. The plan is to do the same with my melons. sjohnson9206 wrote: This is the first time we've trellised cukes, but I have arched a cattle panel, 50" wide and 16' long, to grow the cukes over. I have 4 plants at each end of the panel and will train them up. The plan is to do the same with my melons. That should work very well. 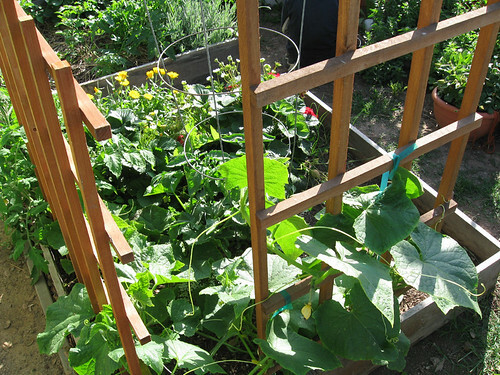 I think the trellis idea, any kind of trellis is great for cukes. They get more air, more light, the fruit grows straighter while hanging. All round best way in my opinion. Don't forget you can plant cool weather or shade crops under the trellis like lettuce etc. gixxerific - Oh yeah - I can see where that trellis will work really well for ya. EGarden love the trellis dude. I might have to do some modding to mine before it is all said and done. I might need some wire like you have, I know I probably will but I'm too broke to be buying wire right now. So I will work with what I have. I just use regular plant trellis, because I found them in the alley - so they were free. They are too short, but I just let them go up and down on the other side. This year I put two together at an angle and planted greens underneath. sciencegal wrote: This should work then. I liberated a 5 foot by 30 inch section of cattle panel that was being used as a temporary gate. I figured it would make a perfect trellis but it seemed kind of tall. It's too cool yet to plant cucumbers and beans. I'm just in the dreaming stages. I made a very small raised bed for the cucumbers, just 3 feet by 5 feet. After digging down only about 8 or ten inches I hauled off 25 gallons of rocks. Most of my garden in containers or very small raised beds. I use a cattle panel for climbing plant support... At least for cukes and pole beans... 5' x 15' panels. Drive 3 or 4 steel fence posts into the ground, slap that panel up there and zip tie it in place... Nice and neat... The panels aren't all that expensive at your local farm supply (as long as you have a way to transport them) and over a number of years will pay for themselves. I like straight cukes and so do my customers... Nice for space saving also. gixxerific and joyfirst - thanks! I took a picture this morning of the cuke arch.. I'll be doing the same thing for melons. I'm also starting some spinach inside and once that gets going I'll transplant under the arches through the cloth. sjohnson9206 wrote: I took a picture this morning of the cuke arch.. I've seen people arch the panels over the path into the garden with both ends attached to planter boxes. It is very pretty with the cucumbers hanging down over the path and either flowers or veggies in the planter boxes. Maybe grow some tall tomato plants on the arch and pick tomatoes as you walk under the arch. If you have a fence around your garden, you can build your gate into the arch. 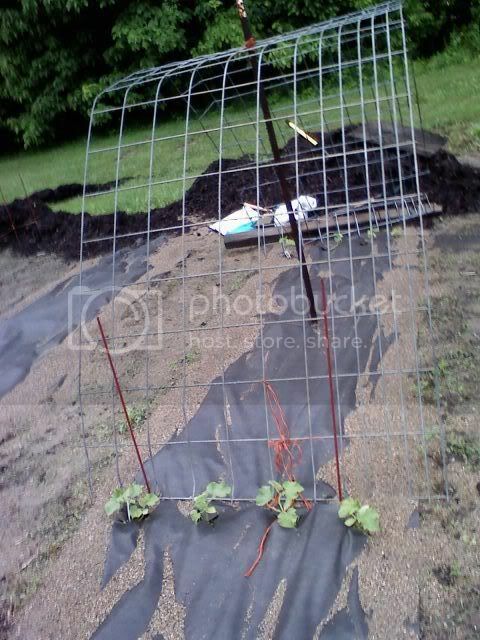 So for my cucumber trellis the biggest fencing I could find at Home Depot was 1 inch square plastic fencing. Is this big enough for cucumbers? Samantha, that's gonna do very well for cucumbers. Cucumber vines producing predominantly female flowers. In a Tizzy over Trellising!